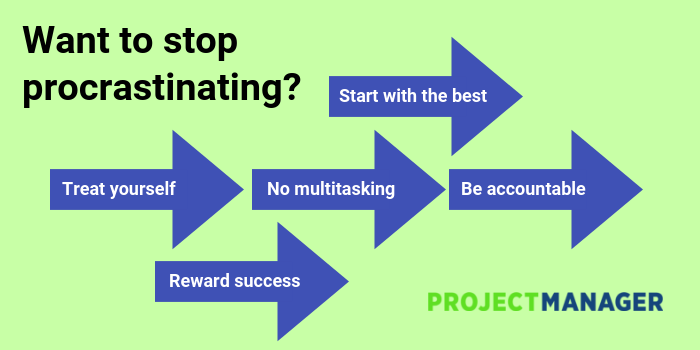 There’s a great way to stop procrastinating, and we’ll tell you about it in a minute. First let’s straighten up our desk, maybe get another cup of coffee and then check social media to see what our friends are having for lunch. Oh, it’s lunchtime now! We’ll get to that anti-procrastination technique after we eat. Well, then we’ll likely be tired and need to digest. Before you know it…quitting time! Don’t worry, we’ll get on it first thing in the morning. Wait, what were we talking about? Okay, that’s a bit of an absurd scenario, but it’s not too far-fetched. According to a British study by rebootonline.com, cited in Cambridgeshire News, workers spend 122 minutes a day procrastinating. That means these employees are only working 73 percent of their workday, even if their timesheets say otherwise. That’s a lot of money companies are paying their staff not to work. The survey also noted that office workers were spending up to 37 minutes on social media a day, which frankly seems like a conservative figure. If you don’t care about your employer, think about yourself. Procrastination is not good for you. Science has studied procrastination and the results are not good. It plays havoc on your emotional state and creates more stress. It makes your brain work harder because you’re not allowing it to rest. But worst of all, procrastination only makes you work harder in the end. Because when you procrastinate, you’re taking more time to get something done, which will put you further behind the next task and even more so if you continue to procrastinate. The best of something you don’t want to do might seem like an oxymoron. If there was something you liked, you’d do it. But even the most heinous tasks have a kernel of something pleasant about them if you really think about it. So, really think about it. What part of the job are you dreading least? Do that part first! This is a great tactic because it gets you started, which is a big step towards stopping procrastination. Also, once you have something under your belt it gives you a sense of confidence that will help motivate you to continue. Best of all, getting started with the work makes it feel less insurmountable and easier to follow through with the rest of it. When it comes to behavior modification, people are like Pavlov’s Dog. Feed them every time you ring a bell, and they’ll salivate when you ring that bell. Therefore, if you can associate something you like with a task you perhaps don’t like, it’s more likely you’ll do it. No less an authority on behavior than Psychology Today noted that we procrastinate the most when we’re in a foul mood. To break that foul mood, try giving yourself a treat to make you feel better. It could be a candy or a stroll to your favorite nearby park or shop. Or, you could put on the headphones and listen to a song you love. Whatever it is, you’ll be surprised at how a small thing like that can put in you in positive mood and heighten your focus, which makes it easier to get down to business. If you don’t want to start doing something chances are you’ll start thinking rather than doing. That thinking can be suspect. You might come up with a great idea like doing a dozen tasks at once, so you can finish all your work before lunch. That is called multitasking, which we know is not an efficient way to get your tasks done. Sure, sometimes you can’t avoid it. But we really can’t do two things at once. We’re just jumping between one and the other, neither of which gets the necessary attention. All you’re really doing is exhausting yourself, which will lead to further procrastination. So, break your work down into smaller tasks and then address each of those singularly without interruption. When you’re dealing with a small task, the finish line is visible and that makes it easier to complete the work. Using a task management software can help you prioritize your tasks for optimal efficiency, helping you avoid another unnecessary trip to the water cooler. If you work without accountability, you’re setting yourself up to procrastinate or worse. When you’re not reporting to someone, the temptation to slack off is great, especially if you’re already a procrastinator. If you don’t have someone to be your task master, assign one. Forbes calls that person your accountability buddy. Find someone who is responsible of course, but also someone who has more experience than you. Your accountability buddy can also act as a coach to train you for better work habits. You can have that person check in on you daily or weekly, whichever is best suited to your work schedule, either in person or even via email or some collaboration software. You’ve heard of the carrot or the stick? That’s choosing to either give someone positive or negative incentive to do something. But how about the carrot and the stick? Think about a stick that is dangling the carrot just out of your reach. That’s motivation! You’re going to strive forward for that reward. Well, let’s take this idea and provide a practical alternative. It’s sort of like treating yourself with something small to get in the right headspace to start the job. Now you’re offering to treat yourself after the work is done. Same idea, different angle. All these suggestions on how to stop procrastinating require building up your routine and discipline muscles, but the good news is the more you do it, the more second-nature it becomes. Now, what are you waiting for? It’s easy to procrastinate if you don’t have the tools necessary to get the work done. ProjectManager.com is an online project management software with powerful features can that help you start and finish projects. Don’t procrastinate! Try it now with this free 30-day trial.